Dancing With The Stars Las Vegas Odds Going Into Week 9 – May Shock You? Unreal. I think the odds makers have it totally wrong this week putting Apolo last. If anyone should be last, shouldn’t it be Kelly or Emmitt? Then again, it’s pretty tight odds for the last three (Kelly, Melissa, and Apolo). Even still, shouldn’t Emmitt be last and at higher odds to go home than the rest? Let’s get my cohorts thoughts on this to help make sense of it and be sure to let us know your thoughts too in comments. Heidi: Ugh, if we get THAT as a final three?? Anyway, look at last weeks odds – they had Gilles in the number three spot and he’s GONE. That’s where I will hang my hat. They RARELY get the order right, although by now they do usually have the winner right. I’m not so sure I buy into that this time around, with it being the All Star Season. I’m not quite sure why they think that Kelly should be up that high unless they completely buy into the judges rambling. If that’s the case, why are people who bet on Shawn actually going to OWE them money?? Isn’t that what the odds are saying? If they are going with what the judges say, Shawn shouldn’t be anywhere near the top – or do they see through Len as well as we do? Anyway, I think the final three is going to be Shawn, Apolo and Melissa, with either Shawn or Apolo winning. I’m starting to wonder if I’m wrong about Apolo though. I’d be lying if I didn’t admit that up front. He’s not getting Ralphed in the slightest – but he also isn’t getting the love I think he deserves, while Kelly is getting far more love than she deserves. But I guess it’s in her ABC contract. 🙂 She was only one point back from Shawn on the Viennese Waltz and she should have been at least two. Courtney: I feel like pulling a Joe Pesci in Casino and laying the beat down on whatever asshat is setting these odds 😛 No way in HELL do I see Apolo as the low man on the totem pole – and my only explanation is that maybe these oddsmakers are also buying into the judges’ low-balling of him…and OTT praise of Emmitt, Kelly, & Melissa. Although I have to say, if the judging last week was any indicator – I think the dew is beginning to wear off the rose with Kelly, much in the same way it was with Gilles in previous weeks. They could have easily copped out and given her 29’s & 29.5’s like Gilles & Apolo – or really gone buckwild and given her 30’s like Melissa. But they didn’t – they gave her a comparably low 28 & 28.5. It didn’t make much of a difference in the great scheme of things, since there were so many points factoring into last week’s elim, but just the fact that they actually seemed to call her out on some of her errors tells me that she’s not immune to criticism & lower scores. But as Heidi has said, week 9 is the week that the judges tend to get real and really show their cards – that is, who they want in the finale. So I think whatever scoring we see this week is really going to tell us who the judges want in the finale, and who they don’t…and I honestly think they’re going to go for whatever combination they feel will produce the most entertaining finale. I would think that would have to include Shawn and Apolo, and then I think it will be a toss-up between Melissa or Emmitt. As almighty and powerful as the soap fans seem to think themselves, I don’t believe for a minute that they can compete with the might of an Olympian or NFL fanbase. DWTS Season 15 Las Vegas Odds Going Into Week 8: Are they wrong or right? The odds makers at Sports Bovada are convinced Kristie Alley is going home from Dancing With The Stars …and more than ever this upcoming week. Don’t worry though! They’ve been wrong in the past with 100/1 odds, but, unfortunately, they’ve also been right. They also have more faith in Gilles Marini and Emmitt Smith than many fans do. I don’t know what to think, but, I’m pretty sold on the idea that “fan base” is going to determine who wins this competition this time especially after Sabrina was eliminated. If that’s the case, I think Kelly and Melissa (even though I like them) are history this upcoming week….or possibly, and hopefully, my dream elimination GILLES!!! 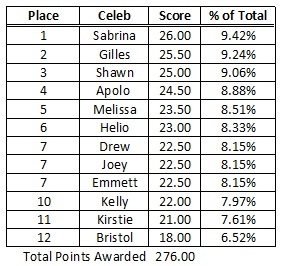 I think Shawn should be first, Apolo should be second, Emmitt should be third, and Kirstie should be fourth. Let’s see what my collaborators think and be sure you let us know in comments too….